The European approved CONA® CMM Single post-tensioning system is an internal system with one strand for unbonded or bonded applications. The system is typically used for suspended slabs of car parks, apartment buildings, commercial office space, shopping centers but also for slab-on-grade applications in distribution warehouses. The main components in the anchor zone of the CONA CMM Single system are the wedge, monolithic anchorage and an individual transition tube. The anchoring of the strand and load transfer to the concrete is done with one and the same unit, allowing for a high economy, small centre and edge distances at the anchorage, as well as application of the full post-tensioning load at very low concrete strengths. CONA CMM Single tendons can be coupled using proprietary Type H sleeve coupler, whereas the coupler can serve as a stressing/active anchorage coupler (Type S) or fixed/passive anchorage coupler (Type F) during the first construction stage. For CONA CMM Single unbonded applications, the monostrands are greased/waxed and individually sheathed in a factory with a continuously extruded HDPE sheathing. 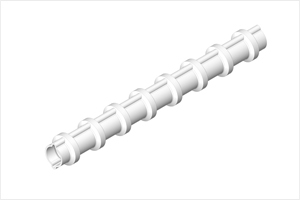 In bonded applications, the individual strand is enclosed in a corrugated round plastic or steel duct and is filled with a high performance BBR grout.